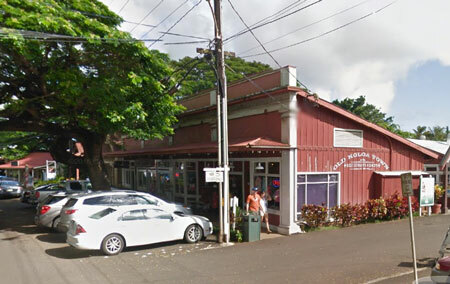 The Kahalewai Building is on Kōloa Road in front of “The Old Paint Shop.” The original building was put up by Dr. Waterhouse in 1927 (Kahalewai means “the water house.’) It first contained a small post office at the west end, a general store operated by the Ornellas’ in the middle and a tailor shop at the east end. Later on, it held Mr. Iwai’s watch-repair shop, Mrs. Tanaka’s beauty shop, a Filipino’s tailor shop and Dulce’s Dress Shop. During World War II, the entire building except for the post office was taken over as an Army bakery.